Next week, we’ll be in New York. We’re releasing our new book, TWO BROTHERS, we’ll have a table at Artist’s Alley (Y1), we’ll have signings and a great special panel. We couldn’t be happier to be in New York for this. Here it is. The best way to kick off this incredible week. We’ll answer questions, talk about the production of the book and continue to spread our love for comics, and we’ll sign your books. 8PM - Image Comics NYCC Afterparty at Bowlmor Lanes. You can buy tix here. 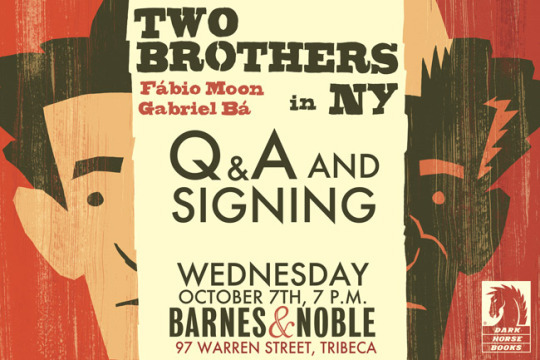 Eisner Award winners, Brazilian Wonder Twins Gabriel Bá (Daytripper, Umbrella Academy) and Fábio Moon (Daytripper, Casanova) have returned for a new collaborative original graphic novel with Two Brothers from Dark Horse Comics. Join them as they share their experiences, both inside and outside the US comics market and invite young creators and readers to a discussion about career choices, foreign languages, exotic places and how the best way to make it big might not be by doing what everyone wants, but by doing what only you can do. 1PM-1:50PM - Signing at the Dark Horse booth. We’ll be at the show every day. If we’re not on one of the above events, we’re probably at our table (Y1) at the Artist’s Alley, selling exclusive copies of TWO BROTHERS. If you can’t come to the release signing on Wednesday, our table is your best ( and maybe only) chance to get the book before it get to stores in two or three weeks. 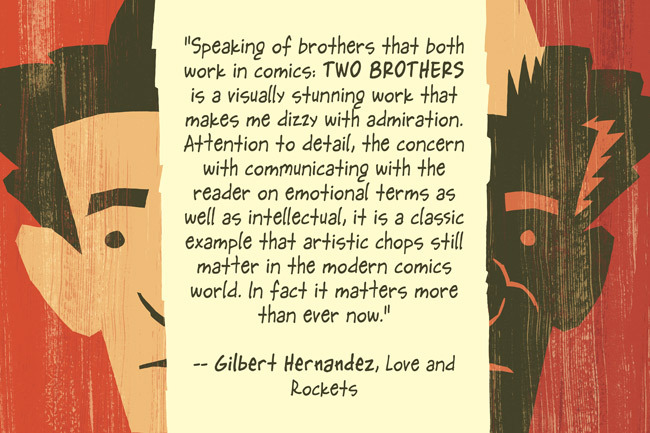 "Love & Rockets" author Gilbert Hernandez read an advance copy of TWO BROTHERS. Nothing is impossible, but only if we do it together. These goals only will happen if we tell everyone about them. 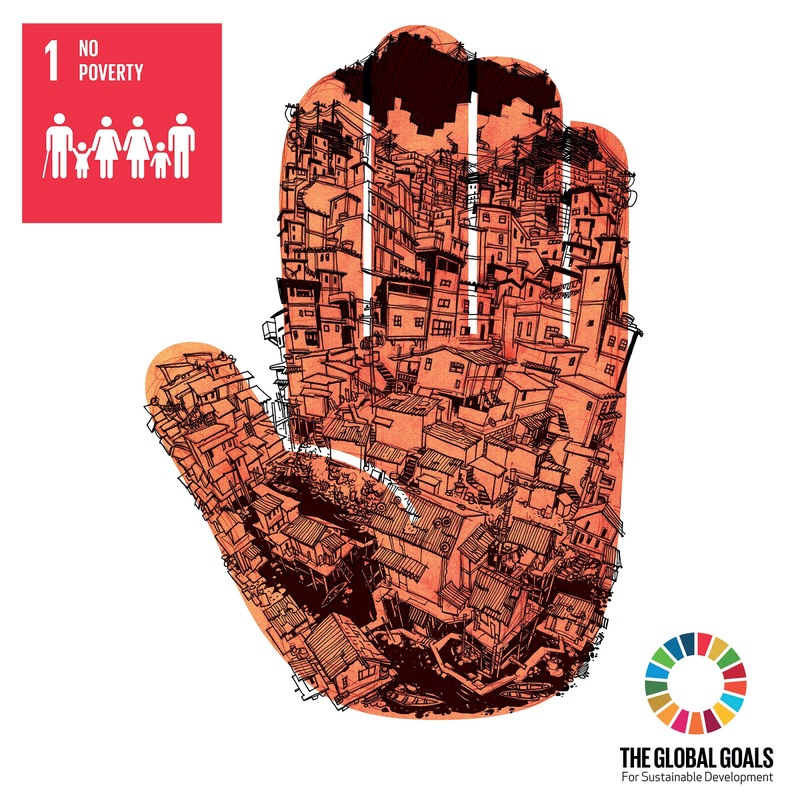 The first goal is to is to end Poverty. 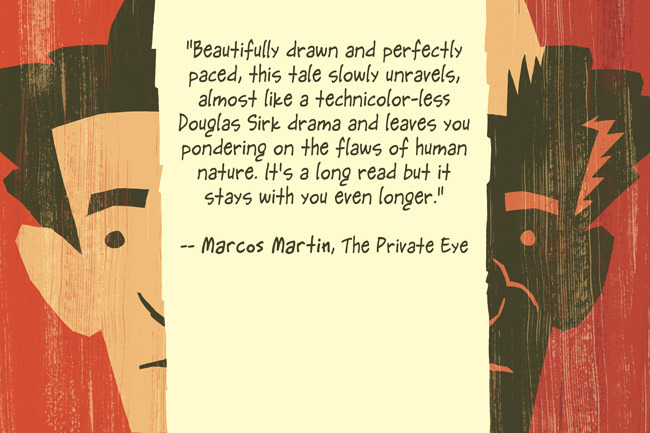 Marcos Martin, artist extraordinaire of “The Private Eye”, read an advance copy of TWO BROTHERS. 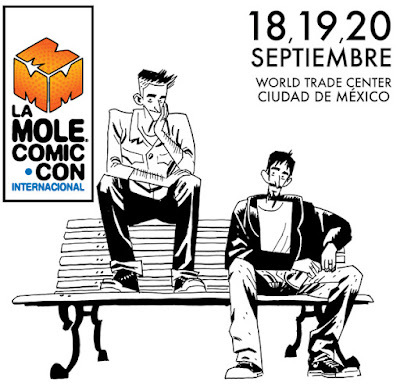 ¡Vamos a MÉXICO para La Mole Comic Con! Vamos a tener dos mesas en el Artist Alley (A1018-A1019), dónde estaremos todos los días. - "BAJO LA SOMBRILLA DE LOS GEMELOS FANTÁSTICOS. Desde Brasil, los hermanos Gabriel Bá y Fabio Moon, artistas multipremiados de la industria del cómic, platicarán sobre su trabajo en The Umbrella Academy, Casanova y Daytripper, entre otros proyectos. Moderador: Jorge Tovalín." Aqui una pagina acerca de nosotros. I’ve been doing this since SMOKE & GUNS. 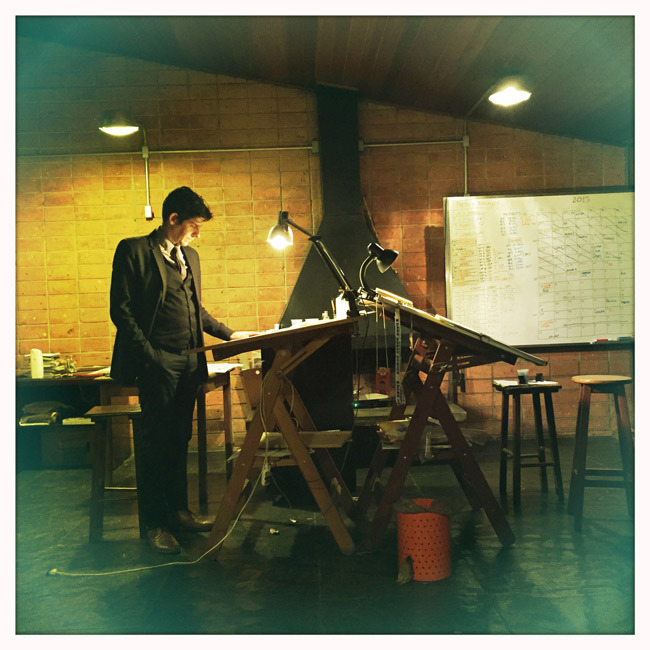 On the day I ink the very last page of a story, I put on my suit – now I go all three piece – and I draw all day looking my best. “This is a day I want to remember”, I think. Today I finished another story. I actually inked two pages, and penciled most of one. It feels good to be done. I’m proud of these pages. I’m proud of this story. Mat Johnson read TWO BROTHERS. "Loving Day" author Mat Johnson read an advance copy of TWO BROTHERS.